Choosing the right cookware can be a daunting task. This is mostly because there are lots of options of cookware ranging from stainless steel, cast iron, to nonstick type. Each person may have a different choice for cookware because they may have a different need. The popular options of cookware are stainless steel and nonstick. Each of the cookware has its advantage, disadvantage, and also function. However, the wrong selection of cookware may ruin the recipes. Even though they are different, but stainless steel should not be seen as the enemies of nonstick. Yet, it is important to know the difference between a better selection of the right cookware. Here is anything you need to know about stainless steel vs nonstick cookware. Even though it is named stainless steel, but it is not purely made from stainless steel. Stainless steel cookware is made from a layer of stainless steel and uses aluminum as the base. Some brands may also use copper as the base. This kind of cookware is mostly used by professional chefs as well as celebrity chefs. 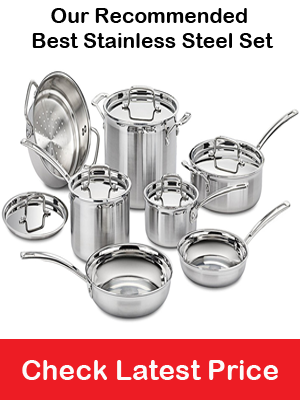 Undoubtedly, all professionals agree that the stainless steel cookware is the right option. Compared to other cookware, stainless steel is very durable and can stand high temperature and even can go in the oven. This cookware is also versatile as professionals can cook numerous dishes with that. The main concern of stainless steel cookware is it requires a certain level of cooking ability to cook as well as maintain the cookware. Even though it is less demanded than cast iron, stainless steel cookware is somehow less forgiving than other types of cookware. When cooking with stainless steel cookware, you need to know the right amount of butter, lard, or oil. Plus, you also have to know the right time to preheat the cookware at the right temperature without burning the oil. Throughout the cooking process, you should always maintain the right temperature once the ingredients are added. Fail to follow the right temperature will result in the food sticking in the pan. That being said, every type of cookware has its advantage and disadvantages. The stainless cookware also has some pros and cons that you may need to consider before purchasing one. Stainless steel cookware is very durable than any type of cookware. This is because stainless steel does not easily stain or rust. The metallic coating in stainless steel cookware does not go into the food and change the flavor. The best thing about stainless steel cookware is it only requires simple maintenance with gentle rubbing. Even if you do not have enough time to clean, just throw them up into the dishwasher. If in case stainless steel cookware is damaged, it can be recycled into other things. If you are concern about the planet, stainless steel cookware should be the best option. Another characteristic of steel cookware is it does not porous which means it has less chance of dents, cracks, and leaks. As you do not need to worry about dents and cracks, you can use the same metal utensils to cook with. Stainless cookware needs to have copper or aluminum base to give the best heat conductivity. If not, the heat transfer of the cookware is very poor heat transfer ability. This means that cheaper stainless steel cookware may not be a good option because it may have poor heat transfer. The battle between stainless steel cookware vs nonstick cookware seems to continue. The nonstick cookware definitely has a place in most people kitchen. This is because nonstick cookware is great for cooking fragile ingredients such as flaky types of fish and eggs. Most people choose nonstick cookware because it does not require much fat such as oil, lard, or butter to prevent food from sticking. This should be a big help for those who want to limit fat consumption. Even though it does not make food to stick in the pans, nonstick cookware has a major drawback. Nonstick cookware, also known as Teflon, is associated to have an effect on the health. Many people concern about scratches or chip of part of the Teflon get into the food and consumed. To strengthen the assumption, the FDA and EPA claim that Teflon particles are harmful to the human health. The main advantage of nonstick cookware is that it allows people to cook with less fat such as oil, fat, and butter. Cleaning nonstick cookware is also very easy. You just need to wash it with soapy water but you should not use a harsh scrub because it can damage the surface. Nonstick cookware should not be used at high temperature because it can cause toxic fumes. This means that nonstick cookware is not suitable for searing meat or cook dishes under high heat. Nonstick cookware should not be pre-heated. Acidic food can damage the surface of the cookware. As nonstick cookware does not stand high heat, make sure not to directly put water when the surface is in high temperature. When cooking with nonstick cookware, it is important to use non-metal utensils to prevent from scratching. The main concern of most people about nonstick cookware is it is not eco-friendly as the fumes may be a threat to wildlife and human. The choice of stainless steel vs nonstick cookware strongly depends on the need of each person. You can have a nonstick cookware or two for cooking eggs and other delicate ingredients. If you need to sear meat or make the glaze, it is best to use stainless steel cookware. Each of the cookware has its own advantage and disadvantage, but the final choice should be based on your need. Both stainless steel and nonstick cookware have different cooking tips. Make sure to follow the cooking tips to prevent damage or scratch the cookware. With the proper cooking method, both cookware will give you the most benefits.